The city of Chicago is many things. It's diverse. It's metropolitan. And sure, it can be windy. 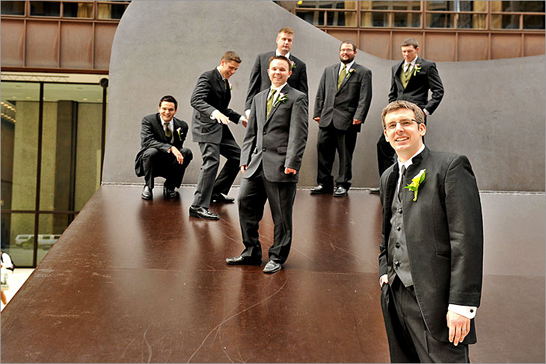 Accordingly, Chicagoans and visitors alike can find numerous opportunities for ideal places and backdrops for beautiful wedding photography. 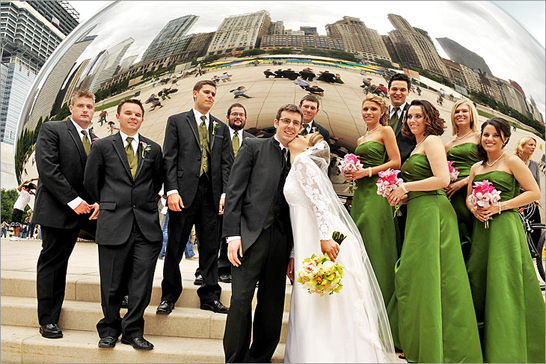 We've selected one favorite, Chicago's 24.5-acre Millennium Park as one must-stop photo locale for your wedding. Completed in 2004, the park contains everything from architectural marvels to outdoor oases. We've highlighted the park's best landmarks — all worthy of becoming the canvas for your wedding memories. Be aware, however, that if you plan to schedule a wedding shoot at the park, it is your responsibility to secure the necessary permit for professional photography. What you should know: The park is open every day from 6 a.m. until 11 p.m. and admission is free. The Millennium Park Garage entrance is located on South Columbus Drive, between Monroe Drive and Randolph Street. Check www.grantparkparking.com for rates. Keep in mind the park is a popular spot for visitors, especially on weekends. About this photo locale: It winds 925 feet from Daley Bicentennial Plaza to Millennium Park. The BP Bridge is a brushed stainless-steel clad structure designed by world famous architect Frank Gehry. The pale tones of the Brazilian hardwood compliment the contrasting metal exterior. What you should know: In the distance, you'll be able to capture a remarkable view of the Chicago skyline. Take some photos of the wedding party on the bridge from the vantage point of the structure itself as well as from Columbus Drive below. About this photo locale: Also designed by Frank Gehry, the 120-foot-high pavilion is an architectural wonder made of stainless steel. A shining metal trellis emerges from the sinewy organic structure housing the stage to envelope the 95,000-square-foot lawn seating area. What you should know: Venture inside the pavilion or around the exterior to capture the details of the pavilion up-close and personal. Or catch a view from the nearby BP Bridge. One thing to note is that the Pavilion holds events and activities throughout the season. You can check with the event websitefor exact times, but they tend to occur on Saturday mornings before 11 a.m.
About this photo locale: Like an oversized glistening paperweight, the 110-ton Cloud Gate sculpture lies centrally in the SBC Plaza. It measures 66 feet long and is 33 feet high. This delightful sculpture, known affectionately as "The Bean", was designed by British artist Anish Kapoor. 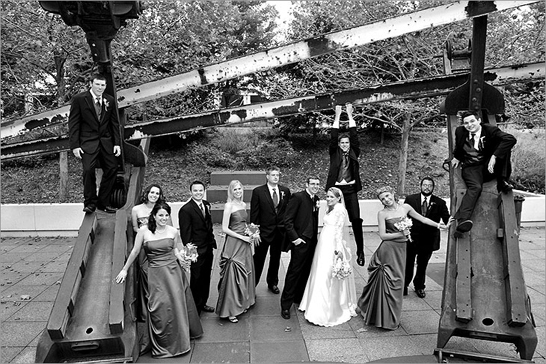 What you should know: This elliptical master of illusions offers boundless possibilities for wedding photo moments. Walk one way and you'll see the mirrored reflection of the Chicago high-rises on its polished stainless steel plate surfaces. Walk under its 12-foot-high arch and you'll be able to capture a kaleidoscope of images on the concave underbelly of the sculpture. Keep in mind that you'll likely share your space with other curious onlookers, bent on figuring out the distorted views the Cloud Gate offers. About this photo locale: Not to be missed, the Crown Fountain is comprised of two 50-foot towers marking the ends of a shallow reflecting pool. Spanish artist Jaume Plensa created this ever-changing masterpiece, which displays the faces of Chicago's own on the giant LED screens. What you should know: The crown fountain makes for some wet, but beautiful imagery. Water spouts forth from the mouths of the faces — or so it seems. A water outlet is placed just so, to create the illusion of mouths spewing water into the shallow pool. Though you'll be able to capture the images year round, the water typically runs from mid-spring to mid-fall, so plan your photographic moments accordingly. You can check with the park for more up-to-date information. About this photo locale: The 2.5-acre park, designed by Gustafson Guthrie Nichol Ltd, Piet Oudolf and Robert Israel, sits on the south side of Millennium Park by Monroe Street. It is a tribute to Chicago's transformation from a flat marshland into the urban powerhouse it is today. What you should know: Look for details to include in the photos such as the 15-foot shoulder hedge, the hardwood footbridge, and over 100 types of perennials. Brides and grooms who don't mind casting their cares and shoes away might endeavor to get a few photographs at the shallow pool. About this photo locale: Even amongst the modernistic aesthetics of many of the structures of Millennium Park, you'll find a nod to ancient Greek architecture. At the north end of Wrigley Square, you'll find the Millennium Monument, a replica of the original peristyle that once stood there from 1917 to 1953. The limestone Doric columns are nearly 40 feet high and arranged in a semicircle around a spouting fountain. What you should know: At night, the lit monument makes for an enchanting backdrop, with the names of the park's founders etched into the base wall of the structure. By day, expect this to be a busy spot for park visitors. Consider taking some close-up shots behind a veil of water as the fountain rains down. Or take a few around the perimeter of the colonnade as you descend the ramp with the structure flanking your left-hand side. In Chicago, there's no guarantee of perfect weather for your wedding photos — especially with possible temperature changes of up to 20 degrees Fahrenheit in an hour. But with a bit of proper planning, you still can make the most out of your photo moments. Wedding tip #1 — When the gloomy skies hit, you'll get low-contrast photos best with shots of trees and foliage. Wedding tip #2 — Even in rainy weather, you can capture some intriguing wedding images in black and white. Wedding tip #3 — If a storm is just clearing, it's prime time to grab your photographer and get some ethereal shots. The moving clouds will add interesting details to your pictures. Morning: You'll get clear, vibrant sunlight for east-facing subjects, such as a shot of you looking towards the lawn with the Cloud Gate sculpture behind you. Midday: This time is perfect for capturing structures like the Millennium monument, but watch out for harsh lighting on the wedding party. Afternoon: You'll get deep blue skies in your background. Later in the afternoon, if you're facing west, you'll have a warm light cast. Afternoon is perfect for landscaped sites like Lurie Garden. Dusk: You'll get the tail end of the sunset and a great backdrop of the skyline, such as from the BP Bridge.